Ginger is a very strong and pungent herb in Chinese Medicine which is used for warming the body. It is great for cooking with in winter to add a bit of spice and pungency to your casseroles, soups and stir fries. Ginger is great for coughs, colds (with chills rather than a fever), settling a nauseous stomach and can aid with stopping vomiting and motion sickness. It warms the circulation and can also help with cold hands and feet. Ginger is the perfect spice to add to your cooking for winter and can simply be drunk as a fresh ginger tea. Cut one slice of ginger (approx. 0.5 cm) and add it to 250ml of hot water. Allow to cool, and drink as required. Combine all the ingredients together and drink while the water is hot. Then rug up very warmly. The ginger and the spring onion will help you to sweat and will help your body to expel the cold. Ginger is also great to add to juices to warm the juice up (juice is viewed as “cold” in Chinese medicine). By adding the ginger, you raise the temperature of the juice and boost the immune system and digestive system and it also increases your metabolism! We have a delicious Ginger Glow Tea that can be purchased in the clinic, offering all the benefits listed. Come in for an appointment or just drop by and pick up a pack to make your winter warmer this year. Cinnamon is very warming and like ginger can be used to warm the channels (meridians/circulation in the body) it is great for people that always feel cold within their body or always feel the cold with cold hands and feet. Cinnamon is a great spice to help combat colds and flus and fungus infections as it has antibacterial and anti-fungal properties (please only take for a cold if you have chills, it is not to be used if you have a fever and sweating). Cinnamon is great for painful periods and should be included in your diet if you notice that you have more period pain in winter. It acts by warming the uterus to aid with blood circulation and by removing the coldness from the uterus. Cinnamon is also very beneficial for treating joint pain – dull and heavy pain in joints. It is great for those that suffer from osteoarthritis and arthritis. Cinnamon is contraindicated for use in Pregnancy. Add with ginger to your favourite juice if you love to juice through winter! Great to sprinkle on your porridge in the mornings too! You can enjoy cinnamon in many ways – adding it to apple crumble, apple pies, with stewed apples, or even as a drink. Use a fresh cinnamon stick and break it into pieces, add these to hot water and allow to steep. Add some honey to taste. For cold feet and or trouble sleeping, add a cinnamon stick to a tub of warm water before bed. This will warm your whole body and calm the body down ready for a good night’s sleep as the warmth helps to relax the muscles of your body. Garlic has been used for centuries as a natural antibiotic. It also is useful for fungal and viral infections. 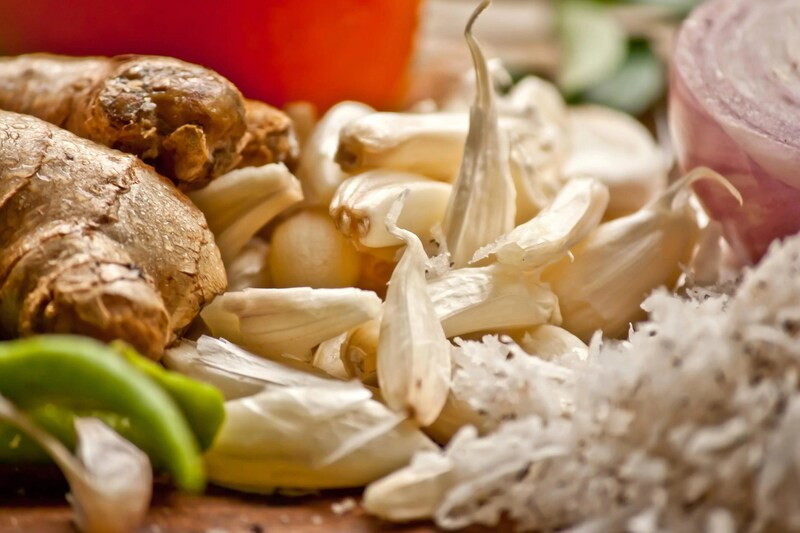 In Chinese Medicine, it is said that Garlic, onion and ginger should be used in every dish to maintain a healthy immune system and to keep the body healthy. Garlic can be used as required and to taste in many dishes: soups, casseroles, hamburgers, stir fries, juices, pasta sauce, pizza, I love to roast garlic with my vegetables when cooking a roast! I simply peel the cloves and throw them in. Garlic can be used to aid with high cholesterol, hypertension (high blood pressure), and stroke prevention. For a cold – you can take garlic fresh, peel the cloves, press a knife down on the clove to release the juice (be careful it is very warm and can burn) and add to a glass of water and drink! NOT FOR THE FAINT HEARTED BUT IT WORKS! Garlic should be a staple in your cooking especially during winter.